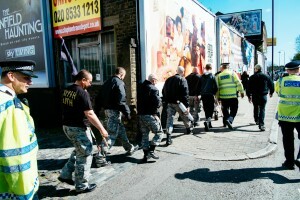 On Saturday afternoon neo-Nazis from a hodgepodge of the British far-right demonstrated in Stamford Hill, the heart of London’s Jewish community. Activists from New Dawn, National Action and the National Front all marched freely in the streets while the community rested for Shabbat. 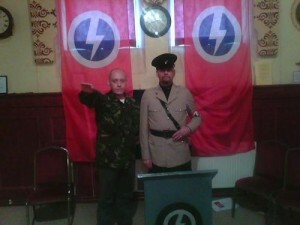 It was, without doubt, the most openly anti-Semitic event to have taken place in the UK for as long as we can remember. So why were the Jewish establishment silent? Where was the statement from the Board of Deputies and the Campaign Against Anti-Semitism? Where was the counter demonstration? Where were our guardians from the Community Security Trust? The Board and other organisations may say they didn’t oppose it because it was a small fringe event. But that logic is not applied to even the tiniest pro-Palestinian activity. A recent fringe academic conference at Southampton University was shut down because of fears of anti-Semitism. It seems like the only kind of anti-Semitism our leadership bodies now recognise is pro-Palestine activism. Advocating for justice in Palestine, for a single democratic state or for boycotts, divestments and sanctions is immediately condemned as anti-semitic. Everything outside that prism is moot. There were no Palestinian flags waved on Saturday. Nobody chanted about freedom from the river to the sea. And so nobody cared. In the week that we commemorate the Holocaust, nobody can claim that we can defeat fascists by ignoring them. We know too well what happens when Nazis are permitted to gain ground unchallenged. The timing of the march makes it all the more significant – and insulting – that local residents were left to face off against fascists alone. Nor is it the only time this has happened in recent memory. Last year, the leader of Jobbik, a virulently anti-semitic Hungarian party travelled to the centre of London to drum up support from the country’s expat community. This is a party that has, at one stage, suggested compiling a list of Jews that pose a threat to national security. But aside from a letter calling their presence “disturbing” the Jewish establishment provided no organised response. This is a rally that would not have taken place without the protection of the police. Almost as soon as the far-right appeared, activists and members of the local community were thrown into a kettle for nearly two hours so the police could actively help a group of Nazis propagate hate on our streets. Lets not forget, this is the same institutionally racist police force that has been actively suppressing anti-fascist dissent for as long as we can remember. Should this really be the group we turn when we ask for help to prevent anti-Semitism? What’s clear is that we cannot rely on a Jewish establishment whose main interest in anti-Semitism appears to be how it can be used to defend Israel to set the agenda of what should and shouldn’t be opposed, and what is and isn’t anti-Semitism. Our community’s definitions, priorities and affiliations have become dangerously contorted. Now, more than ever, we need a rethink.